North American healthcare spending is set to rise by $777.4 billion between 2015 and 2020, according to Deloitte’s 2017 Global Health Care Sector Outlook. The upsurge relates to a forecasted increase in demand driven by population growth, population aging and, in the U.S., enhanced treatment eligibility under the Patient Protection and Affordable Care Act. The projected increase in both spending and demand indicates that revenue diversification — and the need to provide more for less — is more crucial than ever. Thus, health institutions are expanding their service offering and patient flow accordingly — developments that invariably translate into a need for increased parking capacity. However, creating additional parking spaces through physical campus expansion can divert funds away from clinical care. It can also be time consuming, inconvenient, and infeasible, particularly in well-developed urban areas. Fortunately, there are several, immediately deployable solutions that require minimal, if any, capital outlay and provide instant results. A shuttle service from a nearby parking lot is a budget-sensitive approach to increasing capacity and improving patient and visitor accessibility. A well-managed shuttle service is scheduled regularly, provides a consistently high standard of service, and is app-tracking enabled for passenger convenience. Providing a shuttle service often reduces the number and frequency of circling vehicles that are searching for open parking spaces — in keeping with any sustainable healthcare plan — and reduces the risk of patients being late for appointments due to on-site delays. Tip: Well-managed shuttles can help reduce the spread of healthcare-associated infections (HAIs). Disinfecting the vehicles multiple times a day, providing passengers with hand sanitizer and surgical masks, and prominently displaying infection prevention signage should all be integrated into healthcare shuttle operations. Valet parking is a convenient service for many healthcare facility visitors, and a necessity for others — that’s why it’s offered by 19 of the top 20 U.S. cancer hospitals. But valet stacking stretches beyond the traditional service offering. By retaining visitors’ keys, attendants are able to double or triple-park vehicles without disrupting traffic circulation. With more cars in less space, capacity is significantly increased. When managed correctly, valet service can significantly improve patient satisfaction and expedite the ingress/egress experience. 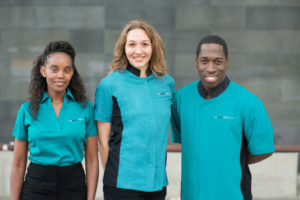 A well-managed service will also allow patients and visitors to coordinate their departure with on-campus valet stations via text or app in order to minimize wait times. Rewarding staff who reduce or relinquish the use of their parking space can be a highly effective way of juggling staff satisfaction with the optimization of visitor and patient parking capabilities. Examples of rewards that we’ve implemented include subsidized or free transit passes, free parking for carpoolers, prize draws and/or trips for those that chose alternative modes of commuting, and offering a free month of parking for every two that an employee rides their bike to work. Planning a reward program also creates an ideal forum for positive dialogue with team members facility-wide; why not ask them about the kind of plan they’d like to see put in place? Tip: An engaging staff reward program that encourages the use of public transport and bicycles can also help to meet green targets and promote employee health and wellbeing. 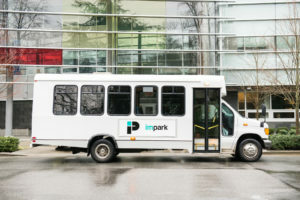 Impark HEALTH offers a variety of customized parking, transportation, and operational solutions to healthcare facilities across North America. Get in touch to see how we can help you.